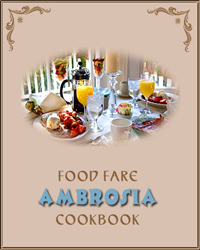 The Ambrosia Cookbook was released by Club Lighthouse Publishing on Monday, 18 September 2011. The Ambrosia Cookbook (ambrosia as in "food of the gods" rather than the fruit salad of the same name) contains more than 200 recipes in all categories, along with special dishes for holidays and vegetarian fare, and easy-to-assemble herb and spice mixes. As not to forget our beloved furry friends, a collection of homemade recipes for cats and dogs is also included. To see a complete list of recipes, click here (PDF, 187 KB). The Ambrosia Cookbook is available from Club Lighthouse Publishing in Nook and PDF editions, and at Amazon in Kindle format. Select your preference and get cooking! Take a look inside the Ambrosia Cookbook with our exclusive screenshots. See a complete list of recipes in the Ambrosia Cookbook and view free samples.